Had the Gentile woman with the demonized daughter (described in Matthew 15 and Mark 7) been raised in the American church, I picture her encounter with Jesus going much differently. She would return home heartbroken to her sick girl, disillusioned and under the impression that this was her cross in life to bear; a change in her awful situation was simply not God’s will. Jesus was looking to get out of the public eye when this happened, away from the crowds. Mark’s account explains that He wanted no one to know where he was (Mark 7:24). But word got out. Along comes a Greek or Syrophoenician woman whose daughter was severely demonized. We do not know how the girl got to be in such a state, nor what diagnosis modern medicine would give her. The affliction made life miserable and disruptive for both the woman and her child. But the woman knew of Someone who could help. The woman knows Jesus is within this house in Tyre. Uninvited, she calls to him, “Have mercy on me, Lord, Son of David; my daughter is cruelly demon-possessed.” Imagine the awkwardness inside the house where Jesus is staying. The host glances out the window, perhaps recognizing the woman or knowing something of the situation. Head wagging. She is not keeping to social norms. Worse, she is of the Syrophoenician race, and considered unclean by cultural standards. The woman shouts and begs. But there is nothing from Jesus. Radio silence. He does not answer her a word. She continues her crying out, begging Him to heal her daughter (Mark 7:26). She is such a nuisance that Jesus’ disciples urge Him to please get rid of her already. Finally, Jesus responds. “I was sent only to the lost sheep of the house of Israel,” He tells her. In other words, you and your daughter are not part of my job description. I came to do the will of my Father, and His will for me is to take care of His people, the Jews. Ouch. Jesus is calling her a dog, and in essence reminding her she’s unclean in his circle. Why should he give what is meant for the sons and daughters to a low-down mongrel? Undeterred in her quest, she acknowledges his response but continues to press her cause. “Yes, Lord, yet even the little dogs eat the crumbs which fall from their masters’ table.” Worthy or not, I have a need and I’ll take what I can get, even if someone else was your priority. Because I know that what you have, even if it be a crumb, is sufficient. Mark 7:29 records Jesus’ response to her as this: “Because of this answer, go; the demon has gone out of your daughter” (italics mine). Imagine the woman’s joy! Imagine the difference in her daughter, the peace in her household, the tears of utmost thanksgiving and worship. Her neighbors would all know that there was a God in Israel, and that He was good. The woman, who wasn’t going to leave Him alone until she secured healing from His hand, would most assuredly be even more vocal and worshipful in light of what He’d done. How His fame must have spread! 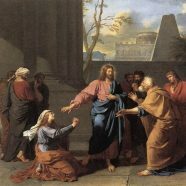 Was Jesus indifferent to the woman and her plight? I don’t think so. Why then, was he so seemingly hard on her? First he ignored her, and then he insulted her. I believe Jesus wanted to draw out her faith. She was desperate, but he was going to let her contend for her answer. Had this woman been raised in our current culture, it seems likely she would have missed her heart’s desire. Steadfastness is regrettably not the hallmark of much of today’s church. Many of us tend to give up too easily. We give trite responses to devastating situations and say, “It must be God’s will” when He was willing all along to grant us our heart’s desire for healing and deliverance and restoration. Or we pray, very earnestly perhaps, but not to the point of breakthrough. We get tired or we focus on the problem instead of the greatness of our God, and without realizing it perhaps, we’re praying from a point of frustration and not victory. Very often, our faith is dominated by past disappointment rather than what is spelled out to us in the Word of God. There’s something about laying hold of Jesus out of desperation and with a line-in-the-sand assertion that says there simply is no alternative but “yes and amen” from him. This woman was not going to budge, even in the face of silence and a rebuke that she was a despised outsider. I believe Christ wants to draw out our faith for that which matters most to our hearts because in doing so, our faith grows. And faith ultimately is God magnified larger and larger in our eyes, until there comes a point that nothing on earth can phase us because of our spirit’s knowledge of Who He Is and What He’s done. In this day, He is calling us to a new level of intercession and to commit to seeing the mountains move. He wants to reveal more of His glory than ever before as we close out the end of the age.